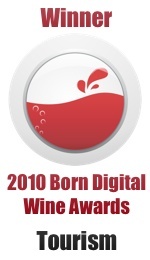 This entry was posted on Wednesday, April 1st, 2009 at 12:00 am and is filed under Wine Tourism General. You can follow any responses to this entry through the RSS 2.0 feed. Both comments and pings are currently closed. Wink, where do I sign up? Doing this all at once would be ever so much simpler than waiting ten years for all the necessary press trips to materialize. Glad you like the idea – I’ll happily put you on the waiting list – demand has been unprecedented. In the meantime, seeing if we can’t squeeze in a side trip to Alsace possibly and Savoie definitely (after all the Rhône goes through a section of the Savoie vineyards). Wink, sign me up! I am IN. RyanAir and 10,410 winos? What’s not to love? What’s the rate for a couple $20,820? Are there any discounts for writers?